Synthavidin technology is a synthetic mimic of streptavidin and biotin binding which results in a very stable host guest complex. 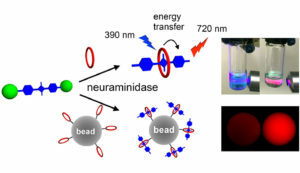 High affinity (Kd ~1 nM) and controllable threading kinetics between a squaraine dye and a macrocycle make them an ideal synthavidin pair with the added benefit of near-infrared fluorescence. 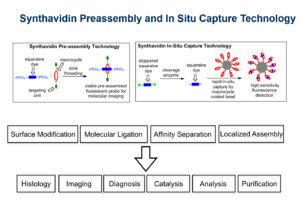 Synthavidin pre-assembly technology takes advantage of the high affinity and slow threading kinetics to produce a library of kinetically stably complexes as fluorescent probes for molecular imaging, whereas synthavidin in situ capture technology relies on rapid in-situ capture by macrocycle coated bead for enzyme activity detection with high sensitivity of fluorescent response. One way to diagnose disease is by monitoring the enzyme activity associated with that disease. Synthavidin in situ capture technology provides a conceptually new type of enzymatic cleavage assay that utilizes in situ capture of the fluorescent product. The enzyme assay can be conducted in aqueous solution where dramatic colorimetric and fluorescence changes are easily observed by the naked eye. Alternatively, affinity capture beads coated with macrocycle can be used to immobilize the liberated squaraine and enable a range of heterogeneous analysis options. With further optimization, this new type of neuraminidase assay may be useful in a point of care clinic to rapidly diagnose influenza infection and also determine which of the approved antiviral inhibitor drugs is likely to be the most effective treatment for an individual patient. Targeted delivery and imaging systems would be an important achievement in medicine. Synthavidin was used to rapidly functionalize the surface of nanoparticles without perturbing the membrane integrity or causing leakage of the aqueous contents. The two‐step method involves spontaneous insertion of a cholesterol anchored dye into the outer leaflet of pre‐formed liposomes, followed by squaraine threading with a macrocycle that has appended targeting ligands. 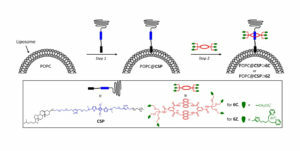 Functionalized liposomes were able to selectively target bacteria in the presence of human cells for fluorescence imaging.